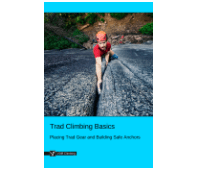 'How To Tie a Water Knot' is part of the e-book - Trad Climbing Basics. The water (tape) knot is useful for joining flat or tubular webbing of equal width. Tie a loose overhand knot near one end of the webbing. Thread the other end into the knot as shown. Retrace the original knot, making sure it lies flat at all times. Cinch the knot tight. The tails should be at least 10cm long. In these cases, the knot is very weak and prone to slipping. The water knot can untie itself over time with repeated loading and unloading. Make sure the knot is tight and the tails are at least 10cm long each time you use it. Some climbers duck-tape the tails to keep them neat and to help prevent creeping. If you do this, leave the ends of the webbing in view so you can see them.